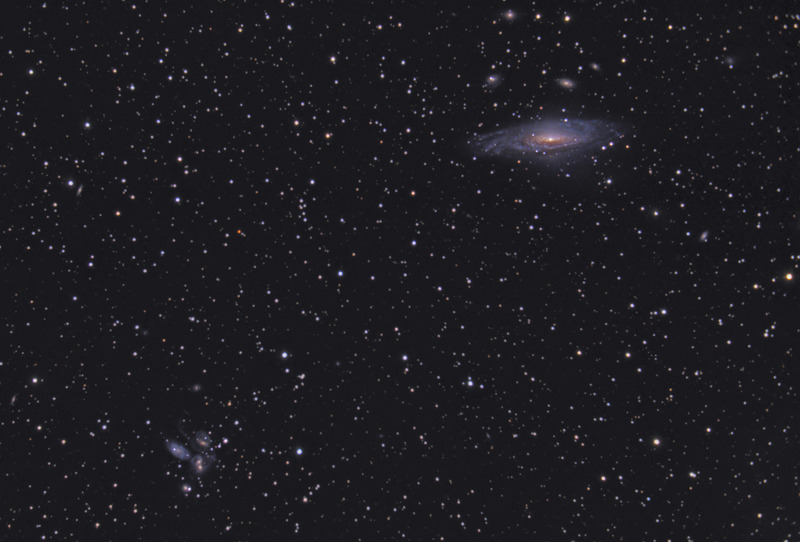 NGC 7331 and Stephan's Quintet form a beautiful collection of galaxies in Pegasus. NGC 7331 is the large galaxy in the upper right of this photo. It is the major galaxy in the "Deer Lick Group" of galaxies. Stephan's Quintet is the group of galaxies in the lower left. 4 of these 5 galaxies are colliding violently, and they were the first compact group of galaxies ever discovered. Close inspection of this image yields more galaxies sprinkled throughout - I've counted over 20 galaxies in total. In this image, North is to the Right. This image is cropped to 90% of the original full frame. Software Used Images Plus 4.0 for camera control, calibration, stacking, digital development, and multiresolution smoothing. Photoshop CS5 used for flat fielding, levels and curves, color balance, noise reduction, and high pass filter. Carboni Actions for addiitonal saturation adjustements and noise reduction. Notes I'm very pleased with the final result in this photo - I think it is my best image to date. I was able to capture good detail, and I think the processing enhanced the image quite a bit. In order to frame both objects, I had to set the focus so that the outer 1/3 of the image was in focus, which leaves the edges and center slightly out of focus. This is a necessary compromise since the focal reducer/flattener does not give a perfectly flat field. Because of this, I plan to photograph each of these galaxy groups separately so that I can focus on the center of the image and enlarge each of the galaxy groups more.